As my Torah study students will attest, the book of Deuteronomy can be pretty tough stuff. Deuteronomy, of course, is the final book of the Torah, and most of it is a monologue delivered by Moses to the Israelites before they cross into the Promised Land. As Moses is about to die, he engages in a kind of review lesson for the people, relating their history, describing their journey and reminding them of the laws they have agreed to as part of their covenant with God. It’s really not to hard to discern these theological threats throughout Deuteronomy– in fact we read them over and over and over again. God tells the Israelites that a deal’s a deal – and they had better hold up their end or else. And of course the “or else” is spelled out repeatedly – often in gruesomely vivid detail. Now, of all the laws contained in this covenant, there is one in particular that God seems particularly uptight about: that is, namely, the law against worshiping other gods. That’s not to say God isn’t concerned about laws such as murder, theft, providing for the poor, caring for the stranger… While these kinds of laws are certainly mentioned, the stakes always seem to be the highest when it comes to the commandment against idolatry – against serving gods of foreign nations. As my Torah study students will often ask, what is up with this? What can we possibly make of this? How on earth are we supposed to relate to this obsessive and insecure God? A God so threatened by other gods that he repeatedly threatens to destroy Israel for worshiping them? And most troubling of all, how do we respond when our sacred texts clearly advocate murderous intent against other nations – commanding us, essentially, to ethnically cleanse them lest they lure us into worship of their horrible gods? Personally speaking, when I come to these kinds of troubling texts, I try to avoid the urge to apologize or rationalize at all costs. For at the end of the day, there can be no apology whatsoever for texts that command this sort of intolerance. As long as there are religious fundamentalists among us who espouse or (God forbid) act upon the literal meaning of these ideas, the first thing we need to do is to clearly and unabashedly call them out in no uncertain terms. To disavow such ideas without apology and affirm that they are morally unacceptable in our day – or in any day for that matter. As important as this is, however, it’s really the easy part. It’s always easier to call out the stuff we don’t like. The real work comes next. If we’re committed to making our religious tradition a genuinely living tradition, we must be clear not only about what we reject, but what we choose to carry forward. We must dig deep, wrestle with the text, go below the troubling surface and find a way to get to what I like to call “the sacred center” – the core meanings and messages that challenge and inspire us in all the ways a religious tradition should. What could possibly be the “sacred center” of Deuteronomy’s nasty threats against idolatry? Well, as I see it, after I scrape away all the fear and the insecurity; all the intolerance and the xenophobia, this is what remains for me: texts that command us to serve God and God alone are asking us to think deeply about who or what we serve – and to seriously consider the consequences of our service. Now I realize that for some, the idea that we must serve God might leave us a little queasy. For many, service of God smacks of obedience to authority – and that pushes any number of our psychological buttons. How could I even suggest to free-thinking liberal Jews that we must spend our lives serving God? I think many of our hang-ups over this subject have to do with the dynamic between power and powerlessness. To one extent or another a servant is someone who is subject to the power of another. That power can wielded benignly or it can be wielded abusively. Either way, no one particularly likes to be powerless – especially when we’re forced to serve a power figure that may not be all that worthy of our service. Perhaps a better way to ask this question is to ask ourselves what service actually means to us. The Hebrew word for “service” is avodah, and it is used a number of ways in Jewish tradition. In modern Hebrew, avodah typically means “work.” In the Bible, it also refers to “slavery” – you may recall we were “avadim” to Phaorah in Egypt, who imposed “avodah kashah” – hard labor – upon us. But interestingly, while avodah refers to the corrupt service of Pharoah, it also refers to the exalted service of God. God says to Pharoah, through Moses: “sh’lach et ami ve’avduni bamidbar” – “Let my people go that they may serve me in the wilderness.” In other words, liberation doesn’t mean we stop serving. It only means that we swap one sort of service for another. We all serve somebody. Or something. Or some behavior. Or some form of materialism, nationalism, or any other number of other isms. But make no mistake: we all serve. Not long ago, someone asked me why there doesn’t seem to be any bowing or prostration in Jewish tradition. I explained that Jews traditionally bow down to the floor only one time of year – and that is during the Musaf service of Rosh Hashanah. This is the time in which we acknowledge God’s Malchuyot – God’s ultimate sovereignty over the world. Rosh Hashanah we openly and unabashedly bow down to the ground and affirm that there is but one Power in the universe above all others. Those of you who have attended these services regularly know that Howard and I do indeed perform the High Holiday service prostrations ourselves (and we invite others to follow our example). When I do this, I don’t feel as though I am somehow abnegating myself or my self hood. For me the act goes much deeper. It’s at this moment when I realize why service and liberation are so connected in our religious tradition. Yes, corrupt service might be a kind of slavery, but truly spiritual service can be liberating. When we empty ourselves of ego and the illusions of our power, we make way for the presence in the universe of a Power, yes even greater than ourselves. And when that happens – when we surrender our internalized need to be in control – we invariably feel as if a great burden has been lifted from our backs. Indeed from our very souls. On Rosh Hashanah, more than any other time of year, we are invited to ask ourselves: What are the ways we feel compelled to bow down to certain people, ideas, values, systems or behaviors that do not deserve and are not worthy of our ultimate allegiance? Are we ready to truly face the limits of our power and bow before the power, yes even greater than our own? Are we ready to serve the Greatest Good we can possibly imagine? Now I realize that all these quotes make a life of service sound like a pretty highfalutin’ concept. So I’ll try and put it in more relate-able terms for you. I was recently reading an article by a waiter from a Four Seasons Hotel restaurant – someone who had been waiting tables for nearly twenty years and clearly loved his job. 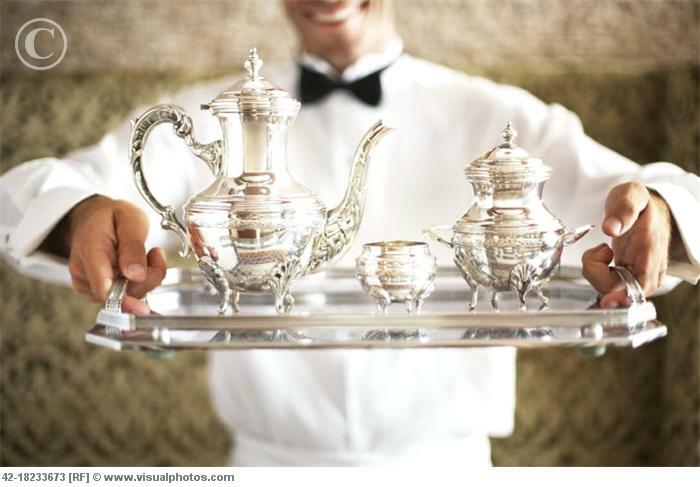 In this article, he wrote about the traits he believed made a great waiter – as I read it, it seemed to me that on one level I was reading a kind of textbook on spiritual discipline. First and foremost, they like the job and love to serve people. Second, they are capable of humility. Good waiters do not accept being humiliated as a fundamental part of their jobs, but they do accept that they serve people and that sometimes those people will be mean, angry, abusive or difficult. Good waiters understand that the job is honorable and takes intelligence and skill, despite what others think. Good waiters don’t act as if the job is just a way to get paid while they write their great American novels, paint masterpieces or find work in big-budget films. They don’t act as if bringing another glass of wine or basket of bread to a table is a colossal inconvenience. They enjoy serving people even when they don’t enjoy serving people. Good waiters develop thick skins and learn how to keep their personal lives at home. Waiters are not separated by cubicles, where they can have bad days and make up for them by working a little overtime or taking work home. Waiters have nowhere to hide when girlfriends dump them or loved ones are sick. No one who is celebrating his or her grandmother’s 75th birthday wants to be served by a grim waiter. So what makes great waiters? Great waiters don’t sweat the small stuff. They understand that there are things beyond their control, like the cooking, the bartending, the sick calls, the parties of 10 that turn into 25 and the rain that comes down in buckets, causing everyone to stay home and ruining a typically busy night. Great waiters don’t let those things bother them. They just keep smiling. The great medieval kabbalist Rabbi Isaac Luria interpreted this verse to mean it is not enough merely to serve God, or even to do it joyfully. No, if we are to be a recipient of blessing, we are expected to experience greater joy in serving God than from any other source of happiness. In a sense, it’s like the waiter said, service is hard work – especially those moments when we don’t feel like serving. But real service, true service – sacred service – comes from nothing but the inherent joy of serving itself. Who or what have I been serving? How has this service been affecting me? How has it been keeping me from living the life I am capable of living? Of being the kind of person I dream of becoming? How can I live a life of service to a greater good? To the Greatest Good? How can I service this Good – or if you prefer, this “God” – even when I’m utterly exhausted? Even when I don’t particularly feel being a servant? And even if I do learn how to do this, how can I serve God “b’simcha” – “with joy?” Not only those times when I’m happy and joyful, but especially those times when I’m not. When the customers are cranky and the kitchen is slow and the parties of ten turn out to be parties of twenty five? But just a few things. There will be distractions. You must constantly ask yourself: who or what am I serving now? Is it sacred or idolatrous service? What do I need to do to redirect my steps so that I don’t wander off this path back into exile? And most important: How can I find the joyous center at the core of my service? Especially at those times when it feels like happiness has left me forever. How can I fan that tiny spark of joy into a fiery blaze once again, so that I may truly serve God with joy? Shanah Tovah U’metukah. A sweet and joyous year to us all. This was wonderful to hear yesterday, and, like the best stew, even better the next. I’m so glad that you lead our congregation.